There is an evolution happening in the world of video chatting. Video chatting is not just for sitting on a laptop anymore staring at a small footprint. I tackled this topic on CNN a few weeks back and since just then even more products have offered ways to video conference proving there's only going to be more and more room for growth. While it would be way too wordy to talk about every option from gaming consoles to freestanding HD webcams - here is a snapshot of a few I think are worth noting. Military families, grandparents and long distance relationships all have tech now to thank for being able to better stay in touch and in some cases the closest thing to really being there. Skype is the first thing most people think of when it comes to videoconferencing. want to mess with a computer. But probably the biggest leap is that Skype has opened the market up to Jetsons like communication in the living room. 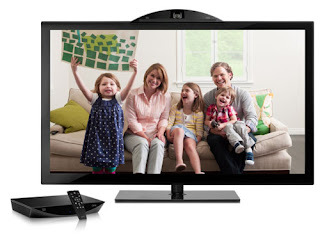 Integrating Skype service into specific Samsung and Panasonic units allowing clear communication through the TV as opposed to a computer. The latest explosion in video conferencing is certainly on the mobile side. iPhone4 (via wifi), HTC Evo and My Touch are just a number of options when staying in touch mobile side. An iPhone4 can even ping into Mac computer with FaceTime. Tablets are coming on board as well – Dell Streak and the Samsung Galaxy Tab have both front facing and rear facing cameras making it easy to video conference. Rumors have it the iPad may even be updated with FaceTime capabilities before the holiday breaking what is usually 12-month product update cycle. With an-add on Logitech camera you can connect to HD video chats using Google TV. I personally think this is the most economical option for getting something on a big screen without having to fuss with a computer viewing a tiny footprint. Simply worth talking about is the recently unveiled Cisco Umi. Cisco likes to call the experience “TelePresence” to distinguish it from things like video chat. It's also not integrated to a certain model so you just hook it up to an existing flat screen. Plain and simple it's another option for bringing a HD video experience right into the living room. Again, not having to fuss with a computer - I think its great for older individuals. Most people, myself included, appreciated the superior output. Pricepoint will hands down dictate consumer interest. We are use to Skyping for free and for a living room experience units like Skype TVs are around $2,000 and Cisco’s Umi is upwards of $600 and $24.99 a month. An average consumer will not pay that. But like all gadget cycles - these are still in an early adopter phase and the price will come down.